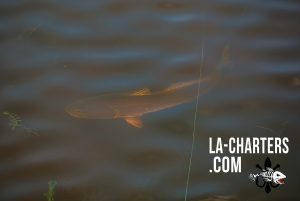 Most of the time when we operate redfish charters here at Louisiana Fishing Charters, we are able to locate an area where the fished are staged up and we pick them off as they pass through that area. We use our years of knowledge to give our clients the right bait, equipment, and boat position to catch the fish. The fight with a redfish can be violent as he tugs on your line, never willing to give up. However, we usually don’t get to see the fish unless they are actively feeding or when they finally take the bait. 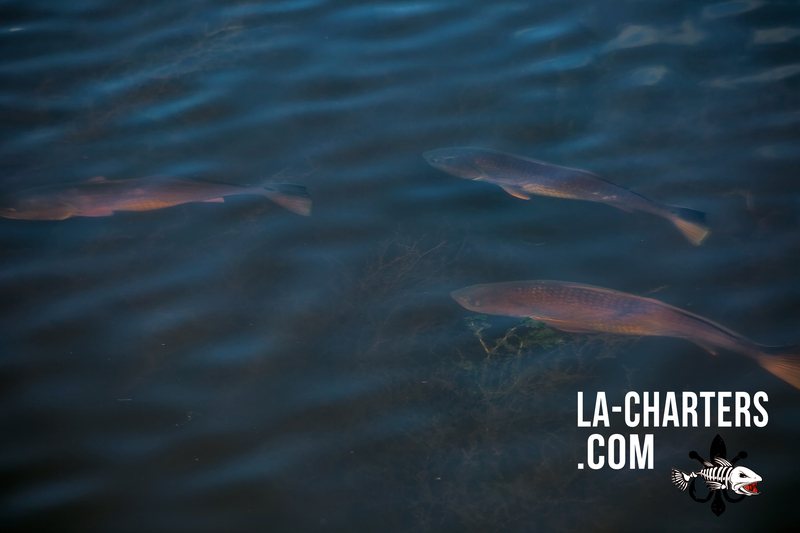 Recently we had a chance to visually observe a school of redfish while out on a scouting trip. If I do not have a charter for a few days, I like to go ride around and visually look for schools of fish that I can take my clients to later on. It’s one of the things I do as a redfish guide Louisiana style. 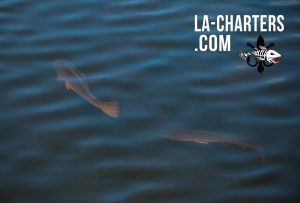 On this particular day we covered a lot of ground and found one school of fish in a shallow pond where the water was somewhat dirty. We took a few pictures of those fish, but the water clarity left a lot to be desired. We ran around a good bit after that and didn’t see much. I decided to run to an area that I knew had clean water but wasn’t so sure about the fish. 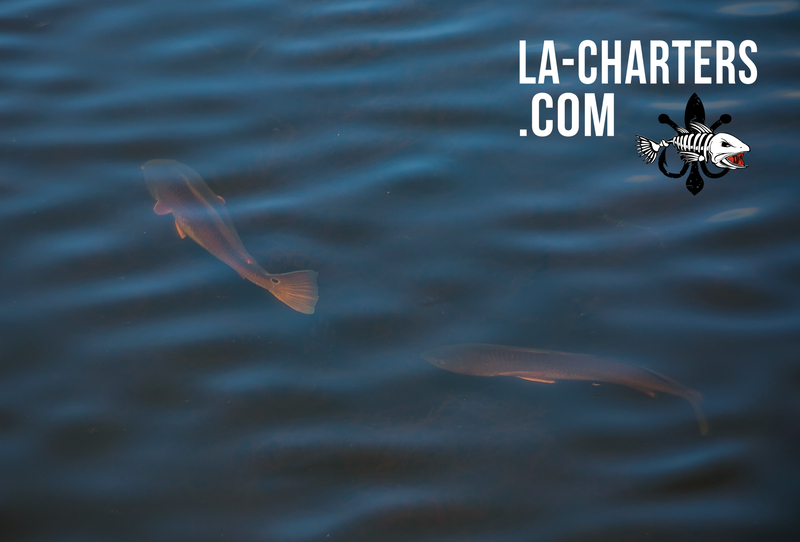 When I shut down the motor, the water was crystal clear and it wasn’t long before we started seeing reds. Before long, we came up on a pack of at least 40 redfish. There is really no good way I can think to describe the heart pounding feeling you get when you see something like this in action. If you have any experience with redfish you know how much fun they are to catch and when you see a big group of them, it’s like staring at a buffet when you haven’t eaten in days. We didn’t catch but a few of them, just to test their temperament. As it turns out they were not super aggressive, but we were able to study how they move as a group and what their patterns were for that time of day and in those conditions. I took some clients back to that school of fish the next day and they had a blast catching them all morning long. 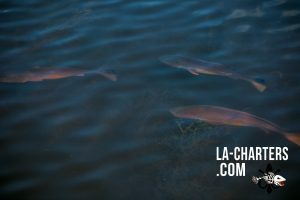 I’d be happy to take sight fishing charters for your next New Orleans fishing trip if you want to try your hand at catching redfish that you can see. Keep in mind, that would not be a trip for beginners as it requires some skill to cast a lure in the right place for the fish to eat it.